Come and experience Uzbek hospitality! ORZU Tashkent Hotel has 24 rooms: 22 Double bedrooms with double bed / 2 Single rooms with one Bed / air conditioning / satellite TV (20 channels) / shower / ISDN phone line / hairdryer. Restaurant. Fax and copy machine at the reception. Laundry. 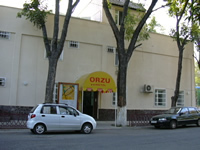 Orzu Hotels group consists of two hotels located in the residential area in downtown of Tashkent within a short walking distance from local restaurants, offering food ranging from national cuisine to European, and within few minutes driving far from main tourist attractions and government offices. Note: Cost of the buffet breakfast is included in rate. 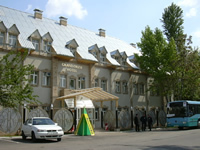 Grand Orzu Hotel has 50 rooms: 21 single rooms with king size bed / 19 double rooms with 2 single beds / 10 deluxe rooms + cost if necessary / air conditioning / satellite TV (20 channels) / shower / hairdryer / ISDN phone line. Restaurant. 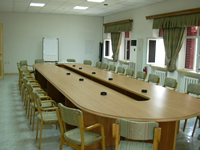 Conference hall. Swimming pool. Laundry. Business centre. 24/7 Reception. This private hotel has been put in activity in April of 2003. The hotel has convenient location for a business and rest and one can find it easily. 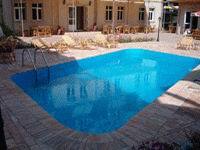 It well equipped with all facilities commonly inherent in good private inns. Hotel provides with an open pool, bar and restaurant with an exclusive menu that is adopted from many national cuisines. There are two conference halls up to 70 seats each, equipped with multimedia. Conference hall rental for 100 pers., incl. mineral water, writing materials, flip chart, screen, white board. Conference hall rental for 50 pers., incl. mineral water, writing materials, flip chart, screen, white board. Note: Philips DCN (Digital Congress Network) is available. Note: In case of accommodation (at least 8 pers.) conference hall will be provided free of charge.